Christmas lighting has been an essential element for the holidays. This year, London Luton Airport has created a lightshow involving an airplane. 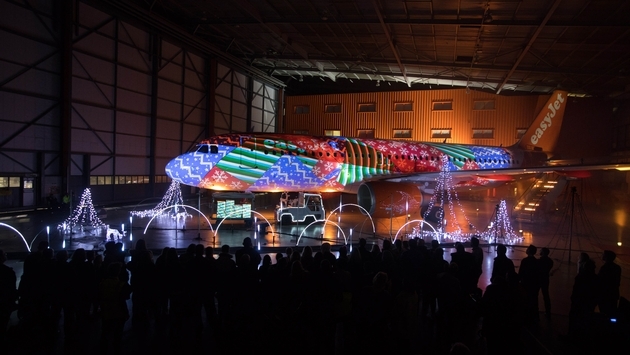 To celebrate the airport’s 80th anniversary and the completion of its three year redevelopment, easyJet provided an A320 Airbus which was wrapped with vivid colored Christmas lights, creating a delightful holiday mood for the staffs and passengers. The eye-catching show used over 850,000 choreographed light sequences and 1.5 miles of LED micro bulbs with are synchronized to the sound of a contemporary remix of Tchaikovsky’s Dance of the Sugar Plum Fairy. The team of 10 special effects artists and lighting designers spent four weeks designing the Christmas light switch-on. The ground staffs of the airport managed to prepare the plane’s festive transformation within 24 hours. “Most people who work in a regular office get to partake in festive decorating, so we laid down the challenge to ground crew to create the most spectacular light show featuring a plane. We were delighted to work with London Luton Airport to help get the festive feeling started amongst our staff and the local community in Luton,” said Tina Milton, Director of Cabin Services, easyJet.